For the first time, global energy production emitted no more carbon dioxide in 2014 than it did the year before - even while the economy grew. As the economy grows, worldwide energy production usually releases more carbon pollution into the atmosphere than it did the year before. But in 2014, the amount of carbon dioxide emitted globally was the same as it was in 2013. That’s never happened before in the absence of a large economic crisis. And to explain, experts point to China. That’s Corinne Le Quéré of the Tyndall Center for Climate Change Research at the University of East Anglia in England. She says China has also worked to produce energy more efficiently, and greatly increased its use of solar and wind. But a few other factors also contributed. Lower oil and gas prices prompted many power plants to shift from coal to less polluting forms of energy. And Le Quéré says the winter was unusually warm in 2014, so people did not use as much heat. This particular confluence of events is unlikely to continue. 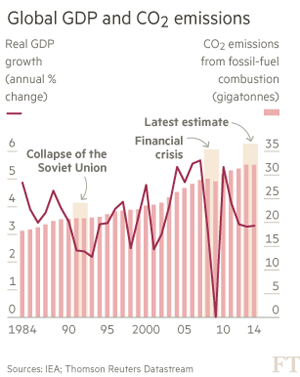 But the halt in the rate of emissions shows that reducing air pollution and increasing clean energy – especially in emerging economies – can help prevent dangerous climate change. Top Photo: Aerial view of Beijing. Copyright protected.